If you or someone in your family suffers from sleep apnea then you are not alone. Sleep apnea is a very common chronic sleep condition that varies in severity. If you have already tried various remedies without success, then certain essential oils may be able to offer some natural help. Sleep apnea is a very common but potentially dangerous sleep disorder characterized by regular pauses in breathing or shallow breaths as you sleep. Pauses in your breathing can occur up to 30 times each hour and can last from a few seconds to minutes before normal breathing is resumed often with a loud snorting or a choking sound. Not everyone who snores has sleep apnea. People who snore but who do not have apnea—researchers call them “simple snorers”. People with sleep apnea can be at a higher risk for Atrial Fibrillation (AFib). (1) Afib is an irregular heartbeat that can lead to serious issues such as blood clots and stroke. So you should definitely see a doctor first before trying any home remedies. Take sleep apnea seriously as its potentially much more serious than simple snoring. There are two main types of sleep apnea with obstructive sleep apnea (or OSA), caused by a blockage in the airways and a relaxation in the throat muscles, being the most common. Central sleep apnea (CSA) which is caused by a failure of the brain to send the correct signals to the respiratory muscles is less common. This article will focus on the more common of the two (OSA). Sleep apnea is not easy to diagnose and it is possible to have the condition without ever being aware of it. Your partner might tell you that you have stopped breathing frequently during the night or you might be aware of waking up suddenly with a snort or a gasp. Waking abruptly feeling short of breath. Waking up with a headache, dry mouth or a sore throat. Fatigue and sleepiness during daytime hours. Excessive irritability during the day. Poor quality sleep caused by sleep apnea is a major cause of daytime fatigue and driving accidents and it can also lead to some other very serious complications. Sleep apnea can cause high blood pressure and increase the risk of heart attack. It can also increase the risk of type 2 diabetes and metabolic syndrome as well as causing poor liver function. Sleep deprivation does not only affect the sufferer but can also affect partners who may have to switch bedrooms to get a decent night of sleep. Sleep apnea can affect anybody at any age but there are certain risk factors that contribute towards the condition. Gender: Men are about two times more likely to have the condition. Being overweight: Overweight people and those with a large neck size are more at risk. Age: Although people of any age including children can have sleep apnea, it is more common over the age of 40. Anatomy: People with larger than normal tongues and tonsils are more at risk. Family history: Sleep apnea tends to run in the family. Nasal obstructions caused by a deviated septum. Alcohol: Both alcohol and sedatives can cause sleep apnea by relaxing the muscles in the throat. Smoking: If you smoke, you are 3 times more prone to sleep apnea than a non-smoker. What Essential Oils Are Good for Sleep Apnea? If you are suffering from sleep apnea, it is advisable to seek medical advice and in severe cases, it might need to be treated with airway pressure devices (CPAP) that help keep your airways open. More moderate forms of sleep apnea can be eased with lifestyle changes such as quitting smoking, limiting alcohol and losing weight. It is also possible to treat your condition at home by using certain essential oils. Many essential oils are used effectively to deal with sleep complaints ranging from nervous insomnia to snoring and certain essential oils may prove an effective remedy for obstructive sleep apnea. Essential oils are safe and easy to use and the following oils have been used with a deal of success in treating sleep apnea as well as other sleep conditions. Marjoram essential oil is a warm, comforting oil with sedative properties that help induce sleep. Marjoram oil is a popular home treatment for sleep conditions like sleep apnea. It is also used to calm the nerves, relax the muscles and relieve respiratory complaints. To treat sleep apnea, you can try rubbing a few drops of marjoram oil into the soles of the feet and the underside of your toes. Alternatively, it can be diffused near the bed while you sleep. Try massaging a few drops of this gentle acting oil into your feet, neck, and chest before bedtime to ensure a disruption-free sleep. Lavender oil is very popular because of its diverse therapeutic abilities. It is very well known as a relaxant for those suffering from nervous disorders and sleep problems. Many people have found that lavender oil can ease the disruptions caused by sleep apnea and snoring as well as helping people overcomes insomnia. If your sleep apnea is caused by nasal congestion, peppermint essential oil can help relieve the inflammation and irritation in the lining of your nasal passage. There are several ways to use peppermint oil to treat your sleep apnea. You can simply massage a drop of peppermint oil under each nostril before bedtime or inhale the vapors from a facial steam bath. Alternatively, you can add a drop or two to a glass of water and gargle it each night before bed being very careful not to ingest any of the mixtures. Like peppermint, eucalyptus essential oil is an effective treatment for sleep apnea caused by congestion. It has anti-inflammatory properties and the ability to clear up mucus from the nose and throat leaving your airways clear for easier breathing through the night. Dilute the eucalyptus oil in a carrier oil and then dab a drop or two beneath each nostril before hitting the sack. It takes a little more effort but many people recommend steam inhalation as the most effective way to employ eucalyptus oil for sleep apnea. Roman chamomile essential oil aids relaxation and promotes sound sleep. It also treats problems with the central nervous system and can be especially useful for those suffering from obstructive sleep apnea. Thyme essential oil is another natural remedy that comes highly recommended for sleep apnea and for snoring. It is extensively used to treat respiratory conditions and can help free up the blocked airways that may cause apnea. If you are going to apply thyme oil topically, you must be sure to dilute it first in a suitable carrier oil. Alternatively, you can diffuse the oil near your bed through the night to aid your breathing and help you get an unhindered sleep. Geranium essential oil is widely used to promote calm and good sleep. Massaging a few drops of geranium oil into your chest, neck, and feet before bed is an excellent remedy for sleep disruptions caused by sleep apnea. Be sure to dilute geranium oil before applying it topically. Valerian root has been used for centuries to calm the nerves and aid sleep and valerian essential oil can certainly help relax the body and mind and promote a full night of healthy sleep. People with sleep apnea and other sleeping disorders can benefit from using this soothing essential oil before bed and during the night. You can also try using Valerian Root as well. Lemon oil was part of a researched oil mixture that helped reduce snoring. The mixture of Thyme, Lavender, Lemon, and Peppermint reduced snoring up to 82%. 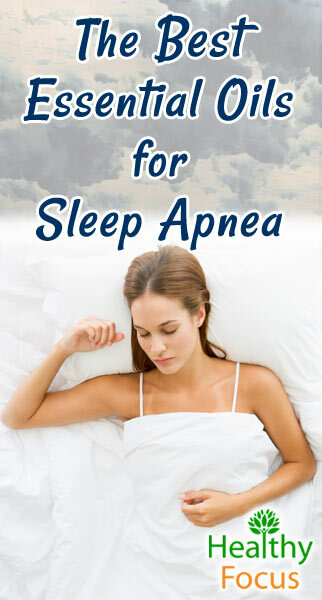 While the research was done on snoring it may also be beneficial for sleep apnea as well. What is the Best Essential Oil for Sleep Apnea? If you had to pick only one essential oil for sleep apnea, then probably you should try Thyme or Marjoram Essential Oil. They have been in most of the studies regarding snoring and is in most snoring spray mixtures. Since apnea and snoring are related they should provide similar benefits. Using a diffuser near your bed—if you own a diffuser this a great solution as you can inhale the oil over longer periods. If you use a diffuser be careful about diffusing citrus oils like lemon—they may damage rubber and plastic on some ultrasonic units—check your manufacturer’s instructions. The good news is that sleep apnea can be treated successfully especially through lifestyle changes. Losing weght, quttiing smoking and cutting back on alcohol are all very effective natural methods of combatting the condition. Sleep devices like CPAP can work very well but they are not actual long-term cures. Surgery to remove an excess of tissue from your throat or palate is another option but it is typically performed when all else has failed because of the inherent risks associated with surgery. What are the long term effects of sleep apnea? Heart atacks and heart failure. There is some controversy over the issue but the recent news that Carrie Fisher’s heart attack may have been caused by sleep apnea has brought the severity of the condition to the public’s attention. Some experts argue that sleep apnea cannot cause you to die in your sleep. The body recognises that it is getting insufficient oxygen before forcing you to wake and breathe. This means that you cannot actually suffocate while you are sleeping. However, people with sleep apnea can and do die from the complications that the condition causes. research has shown that the risk of serious diseases and mortality rates are significantly higher in people with sleep apnea. It disrupts the body’s circadian rhythms, causes an imbalance in the brain and body’s chemistry, increases blood pressure and heart rate and interupts both respiratory and cardiac function. If it continues untreated, the risk of mortality is very real. How do you cure sleep apnea naturally? Try to reach and then maintain a healthier weight. People who are overweight orobese are far more at risk of developing sleep apnea. Use a humidifier in the bedroom at night. Try adjusting your position when you sleep. Consider the use of a sleep device or a snore guard in the short term. Acording to estimates, sleep apnea is a very common condition affecting between 12 and 18 million people in the US alone. Sleep apnea causes a pause in breathing that can last anywhere from 10 seconds up to a minute. These pauses can occur multiple times in a single night. Sleep apnea can affect anybody but is most common in overwight males over the age of 45. Men are more at risk of developing sleep apnea. In fact men are two times more likely to have the condition than women. Obese adults are four times more likely to develop sleep apnea than people at a healthy weight. This is why reaching a healthy weight is such an important goal. Women who are overweight, smoke or drink alcohol to excess have a higher risk than other women of developing sleep apnea. Women going through the menopause are also more at risk. Slep apnea can lead to serious health complications when left untreated. A study conducted by Yale University found that sleep apnea double the risk of stroke while it also increasedblood pressure and the risk of blood clots and cardiovascular disease. Never ingest your essential oil so be especially careful if you are using the oil to gargle. Pregnant and nursing women should avoid using essential oil unless under medical supervision. Before applying your oil, it should be properly diluted in a suitable base oil like coconut oil, olive oil or sweet almond oil. Make sure that you perform a patch test before applying the full dose.